Stressed out and in need of balance in your life? 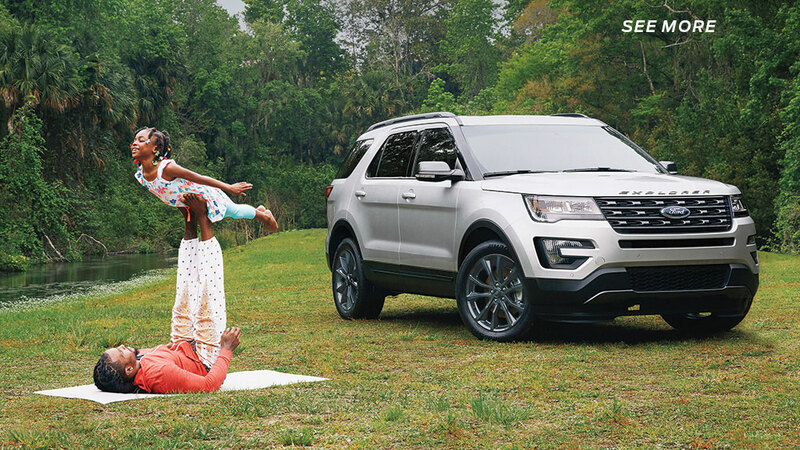 Let the 2017 Explorer, an NFL-pro-turned-yogi and his daughter help navigate the route. Reposted from MyFord Owner Magazine. The pathway to inner peace, as it turns out, can be as simple as a muddy rural back road made of crushed red clay, lined by overgrown orange trees in Central Florida. I’m driving the new 2017 Explorer with two locals, ex-NFL player Derrick “DJ” Townsel and his seven-year-old daughter, Paityn, sitting contentedly in the backseat. Neither seems to be giving much thought to the Eden-like views outside their windows or the monstrous puddles—the aftermath of an afternoon cloudburst—that we’re having to steadily negotiate along the way. Living in the Orlando area, the pair is used to the beautiful and unpredictable wild, but their calmness is also simply a reflection of their nature; DJ is a renowned yoga instructor, teaching workshops across the country while posting his pretzel-like poses on social media under the tag “Rasta Yogi.” He and Paityn, who often meditate and do acrobatics together, have agreed to escape the city for the day and head north to a ranch in the heart of Florida. There, they’ll try to show me, an urbanite eagerly looking for peace of mind, how to achieve “oneness” through meditation and yoga, breaking down the essential lessons of DJ’s workshops in the process. The journey will test not only my spiritual core but also the limits of the Explorer, as the ranch’s 6,000 acres are made up of dense jungle and murky swamps. Nobody said the road to inner Zen would be easy, after all, especially not Paityn, who is fervently asking me to play truth or dare with her as I navigate ahead. With a deep breath, I playfully reply, “Dare!” and keep the Explorer set to 4WD* as we continue north. Driving down into the ranch, the first thing I notice is how lush everything is. Three types of trees—pine, palm and sweet gum—line pristine ponds of emerald-colored water, which exude a pungent sulfur smell. The road is still grainy and slick, so I shift the Explorer’s Terrain Management System™* to Sand mode to help us descend more smoothly. We finally stop in a clearing of grass, and DJ wastes little time hopping out and unrolling his heavy-duty yoga mat. There, he gets on his hands and comfortably positions himself in an advanced pose, with his knees behind his elbows and feet in the air. I’m impressed by the stillness of his form, and I can tell his mind is in deep concentration or perhaps somewhere else entirely. “I started off in yoga solely on poses, but when I found meditation, that’s when I started balancing the physical and the spiritual,” he explains. DJ puts a lot of emphasis on this balance, which he says he wasn’t expecting to find when he began practicing yoga in 2012. By that time, he had already played on two teams in the NFL and was on a lower-level team in Omaha, a town that left him with a lot of free time, he quips. Witnessing constant injuries suffered by teammates and opponents convinced him that he needed to start taking better care of his body, so he began practicing poses and meditation, using online how-to videos as a guide. He quickly noticed an improved range of motion on the field and, to his surprise, “more calm and level-headed” demeanor off the field. This equilibrium, a more flexible body and mind, is the “hidden benefit” of yoga, DJ says, and something he always enjoys watching his students discover. No one is standing in Paityn’s way as she gets down from her perch and enters the Lotus, a pose that comes off like the most extreme version of “criss-cross applesauce” you’ve ever seen—and one that even her dad can’t pull off. All the while, she peppers me with questions, mostly of the philosophical sort: “Would you rather be buried in a deep, dark hole or cut off all of your hair?” DJ, who preaches concentration, shakes his head at the random inquiries, but also acknowledges that everyone’s style of meditation is different. After they’re done, we pile back into the 2017 Explorer, itself the image of confidence with its available Sport Appearance Package featuring Magnetic painted wheels. 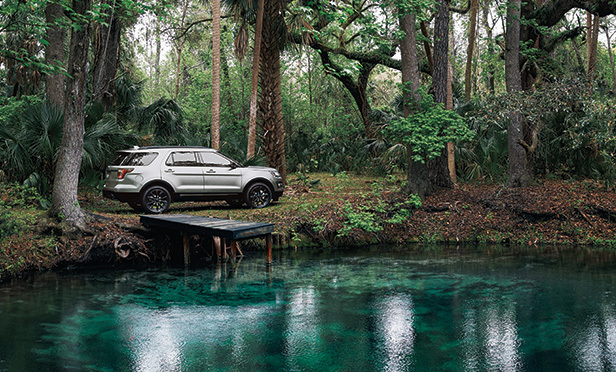 The clouds are starting to burn off, and I open the Explorer’s Vista Roof®* to let in the Florida sunshine. We notice that the warmer temperature is inducing some of the area’s wildlife to become active, and our drive becomes a safari, passing a band of baby alligators lying in the sun and a large horned bull, black as midnight, bathing in a lily-covered pool. The road ahead has become rockier and less visible, shrouded in a curtain of low-hanging tree limbs, but the ride inside the Explorer remains smooth. Suddenly, an oasis appears in the form of a bright green pond, almost phosphorescent in appearance, with a sinkhole in the middle. We pile out of the vehicle and sit on a small wooden dock to look down the hole, an endless column of jade. Here I decide to ask DJ what his description of “oneness” is. His answer is simple: to love your surroundings, yourself and others. “You can’t expect to connect with anybody if you haven’t connected with yourself first,” he says. With that, I begin to reflect on my time here, now surrounded by those who believe peace is attainable through practice. I’m not sure I feel stillness in my heart yet, but looking around at the breathtaking setting, with DJ and Paityn quietly holding hands as they survey the pond’s edge, I feel as though everything is as it should be at this moment. That feeling of ease lingers as we get into the Explorer and make our way back to Orlando, the dense terrain disappearing in the rearview mirror as we clamber safely back onto the highway home. “Sometimes you’ve just got to get away from everything to find peace of mind,” DJ says simply.